Ctrl + Alt + Left/Right Cursor Spins the ‘cube’ that your workspaces reside on, allowing you to select the workspace you wish to use. Ctrl + Alt + Up Cursor Enables an ‘expose’ like feature that presents you with all the windows you currently have open, allowing you to select the one you wish to give focus to. Ctrl + Alt + Down Cursor Unfolds your workspace cube allowing you to see more than one of your workspaces at once, using the left and right cursor keys with this active will allow you to select the workspace you wish to use. Ctrl + Alt + Tab Switch between currently-open windows across all workspaces. Super + W Enables the ‘scale’ effect, it shows all windows from the current workspace. Super + A Enables the ‘scale’ effect, it shows all windows from all workspaces. Super + N Invert colours of the focused window. Super + M Invert colours for the whole screen. Super + Mouse Scroll Wheel Zooms in on the screen. Super + Middle Mouse Button Select a region to zoom into, using a rectangle. 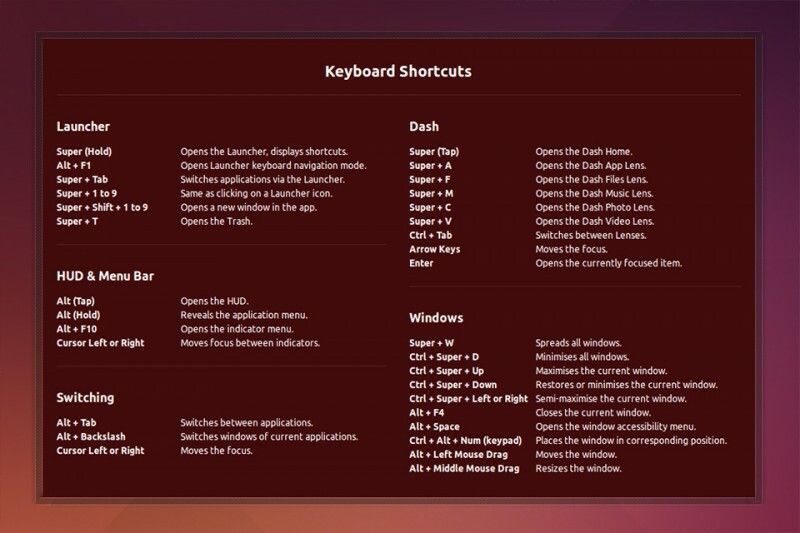 Ctrl + Super + D Toggles ‘Show Desktop’. Alt + Middle Mouse Button Resize focused window. Alt + Left Mouse Button Move focused window. Alt + Right Mouse Button Show window menu.